Lush Fab Glam Inspired Lifestyle For The Modern Woman: Gorgeous Winter Nail Art Designs + Win A Nail Art Gift Set! Gorgeous Winter Nail Art Designs + Win A Nail Art Gift Set! Gorgeous Winter Nail Designs + Win A Nail Art Gift Set! Update: This giveaway is now closed. Congratulations to winner Kyla Lade! It's Mani Monday and we are featuring gorgeous nail designs that are perfect for the winter season! From beautiful reds to cool blue manicures with pretty snowflakes and snowman designs to celebrate the winter season, and chic caviar and metallic tape nail designs for glamorous parties and New Year celebrations. Read on to see more fun and fabulous winter nail art designs. Plus enter to win this week's giveaway, a D.I.Y nail art gift set with all the essentials you need to recreate the gorgeous nail designs featured below. Caviar beads add an instant touch of glam to your nail design, wear these beautiful designs to a party and look fabulous from nail to nail! 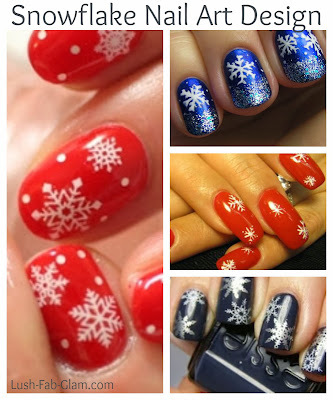 Celebrate the winter season with beautiful snowflakes nail designs. Apply them on top of red or blue nail polish. 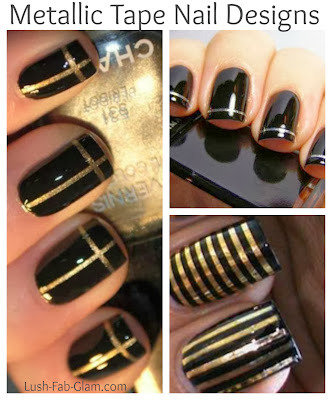 Another glam way to design your nails is with gold and silver metallic nail striping tape. 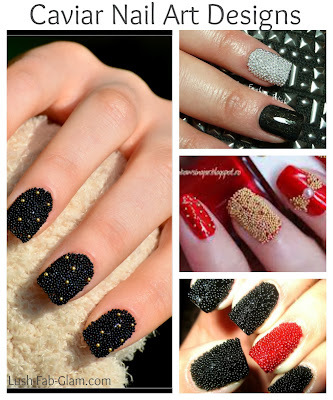 They instantly jazz up any nail color, try one of the nail designs above for your next party or dinner. Enter to win a fabulous nail art gift set with all the essentials that we recommend to get the beautiful nail art designs featured above. Now you can easily D.I.Y and create the manicure looks you love, plus it makes a fantastic gift for any nail art lover/beautista. Fill out the form below to enter. *For More chances to win follow @lushfabglam on Instagram and enter your instagram name in the form below so we can verify your follow. You will gain 5 additional entries for your follow! Contest Rules: This contest ends on Sunday, December 15th, 2013 at midnight PST. Only one entry per email address is required. The winner will be randomly selected and notified by email within 3 days of contest end date. Your gift set will include: nail stamps, multi color caviar beads, gold and silver nail stripping tape, nail stamper with scraper, nail tip guides and a 5 piece stamping nail polish set. *Thank you to BornPrettyStore.com for this fabulous giveaway! Visit their online store to find more fabulous manicure/ nail art essentials and get 10% off site-wide with code LSHW10, they also offer free shipping worldwide! Which winter nail art designs will you try? Share with us by leaving a comment below. Know someone who loves nail art? Share this nail design inspiration post and fabulous giveaway them!